Heron's Problem: What is it? This one is a basic optimization problem. It's quite famous, being discussed in Heron's Catoptrica (On Mirrors from the Greek word Katoptron Catoptron = Mirror) that, in all likelihood, saw the light of day some 2000 years ago. 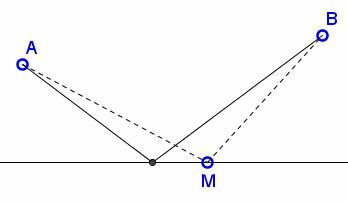 Two points A and B are given on the same side of a line l. Find a point M on l such that the sum of distances from A and B to M is minimal. Think of l as a mirror. Heron posed that the shortest distance between A and B via l is exactly the path traversed by a ray of light emitted from A and observed at B. From here he deduced that when light is reflected in a mirror the angle of incidence fi is equal to the angle of reflection fr, where the angles at hand are formed by AM and MB with the perpendicular to l at M.
AM + MB' ≥ AB'. with the equality reached only when M lies on AB', in which case clearly the two angles coincide. Heron's problem has applications to curved surfaces, ellipse for one. P is a variable point in the given segment AB, and C is a fixed point on the perpendicular AC to the line AB, and D is fixed, on the same side of AB as C, and lies on the perpendicular BD to AB. AC = c, BD = d, and AB = k. Find AP = p such that CP + PD is a minimum when P moves on AB. p = kc / (c + d). P. J. Nahin, When Least Is Best, Princeton University Press, 2007 (Fifth printing).